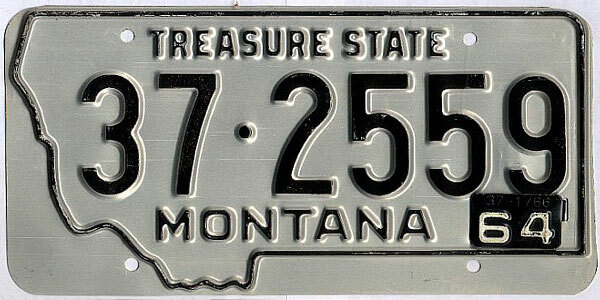 Here's another oddity in Montana's license-plate history ... instead of creating a specific plate for the year 1964, vehicle owners that year received a small metal tag with an embossed "64," which fit into slots on the plate itself. 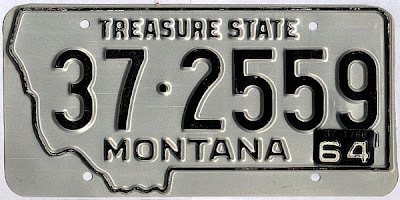 Interestingly, the overall design of that 1964 plate is surprisingly similar to the plate being issued by Montana in 2010. The colors are different now, and the manufacturing process has changed ... and of course the little metal tabs are gone.